As author Emily St John Mandel says, this novel “doesn’t remind me of anything else I've ever read.” Louisa Hall has somehow answered the question of what it means to be human by exploring the world of machines and artificial intelligence. With five disparate narratives spanning centuries and the globe, including poet Mary Bradford, crossing the ocean to the New World in the 17th century, and Alan Turing (of Enigma Code fame), she weaves together a beautiful story of time, language, memory, and loss. Truly a unique novel, and one that will make the reader reflect on it long after the last page is turned. In a narrative that spans geography and time, from the Atlantic Ocean in the seventeenth century, to a correctional institute in Texas in the near future, and told from the perspectives of five very different characters, Speak considers what it means to be human, and what it means to be less than fully alive. A young Puritan woman travels to the New World with her unwanted new husband. Alan Turing, the renowned mathematician and code breaker, writes letters to his best friend’s mother. A Jewish refugee and professor of computer science struggles to reconnect with his increasingly detached wife. An isolated and traumatized young girl exchanges messages with an intelligent software program. A former Silicon Valley Wunderkind is imprisoned for creating illegal lifelike dolls. Each of these characters is attempting to communicate across gaps—to estranged spouses, lost friends, future readers, or a computer program that may or may not understand them. In dazzling and electrifying prose, Louisa Hall explores how the chasm between computer and human—shrinking rapidly with today’s technological advances—echoes the gaps that exist between ordinary people. Though each speaks from a distinct place and moment in time, all five characters share the need to express themselves while simultaneously wondering if they will ever be heard, or understood. Louisa Hall grew up in Philadelphia. She is the author of the novels Speak and The Carriage House, and her poems have been published in The New Republic, Southwest Review, and other journals. She is a professor at the University of Iowa, and the Western Writer in Residence at Montana State University. Hall subtly weaves a thread through a temporally diverse cast of narrators. 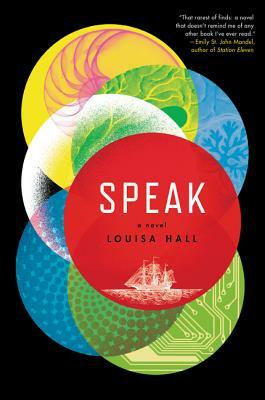 Like all good robot novels, Speak raises questions about what it means to be human as well as the meaning of giving voice to memory. — New York Post, "The Best Novels to Read this Summer"